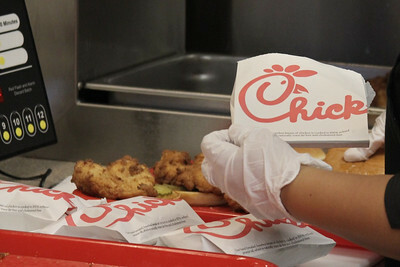 Student takes advantage of Chick-fil-a's Anniversary special of getting one free chicken sandwich or box of chicken nuggets between 12-1pm. 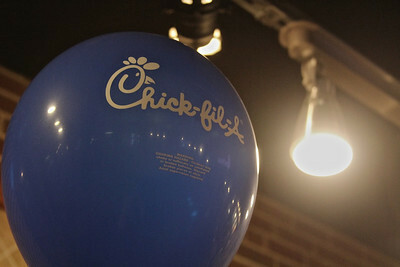 Chick-fil-a celebrates its one year anniversary at Gardner-Webb University by decorating with plenty of ballons sporting their logo. 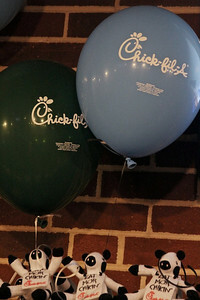 Chick-fil-a celebrates its one year anniversary at Gardner-Webb University by decorating with plenty of ballons sporting their logo and their signature cows. 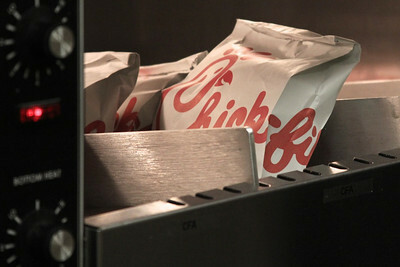 Chick-fil-a's staff worked very quickly to assemble sandwiches for the multitude of students who showed up to celebrate their anniversary at Gardner-Webb University. 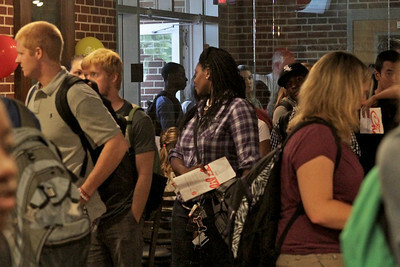 Students lined up through the door and around the Dover Campus Center to celebrate Chick-fil-a's one year anniversary on Garnder-Webb's Campus. 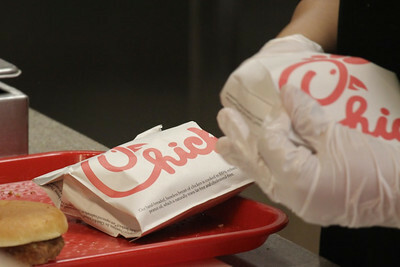 Students recieved free chicken sandwiches and chicken nuggets between 12-1 at the Chick-fil-a in Dover Campus Center at Gardner-Webb for their one year anniversary. 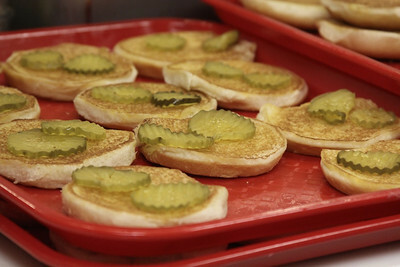 During Chick-fil-a's one year anniversary celebration, buns prepared with pickle slices await pieces of chicken to join them and create Chick-fil-a's famous signature sandwich to give away to students at Gardner-Webb University. 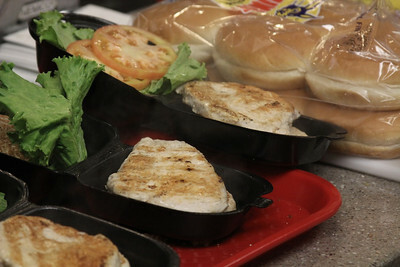 For Chick-fil-a's one year anniversary at Gardner-Webb, they celebrated by giving out free traditional fried and grilled chicken sandwiches. 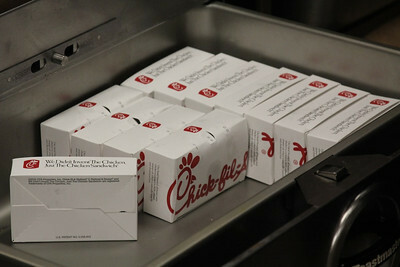 Chick-fil-a staff produced hundreds of sandwiches to be given to Gardner-Webb students on their one year anniversary. 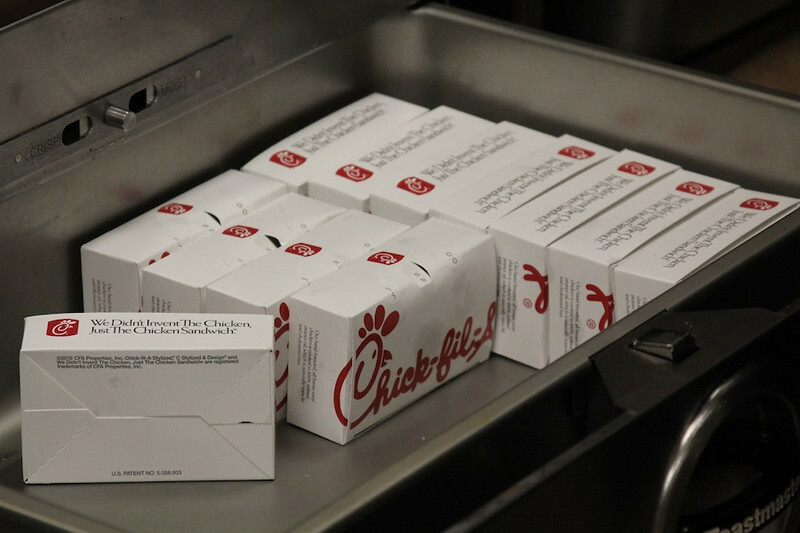 Chick-fil-a staff kept their boxes of nuggets stocked up awaiting Gardner-Webb students as they took part in Chick-fil-a's one year anniversary at Garnder-Webb University. 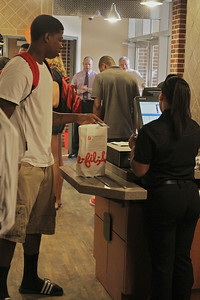 Student Dylan Melton washes down his free Chick-fil-a sanwich with a refreshing drink on their one year anniversary at Gardner-Webb University.